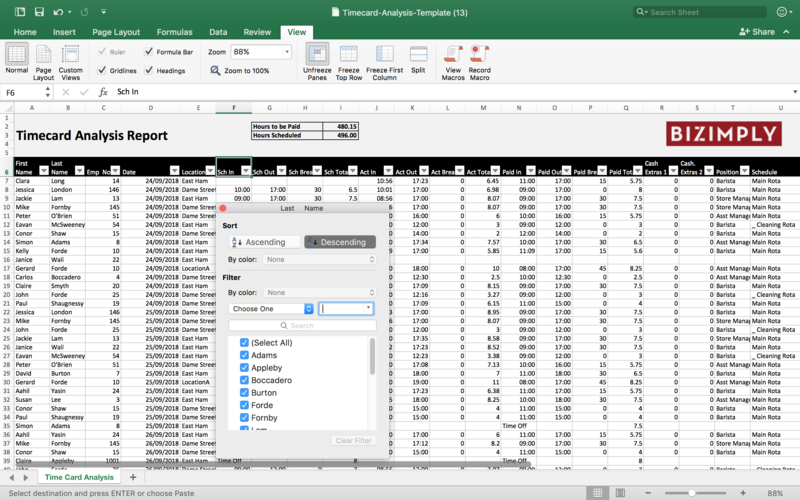 What information can I export from the Timecard Analysis Report? The Timecards Analysis Report will allow you to compare scheduled times, clock in records and paid times across multiple locations, employees, schedules and positions. For a quick over view on how best to use this report, check out this 3 minute video! Select Reports > Attendance Reports > Timecards Analysis Report. Choose Locations, Employees and date range. What information will I receive with this export? Why should I use this report? This report gives you an overall view of your account within the specific date range selected. Unlike the Timecards report - the Timecards Analysis Report will show scheduled times, actual times and selected paid times across multiple locations/employees/schedules/positions. We also have a template if you would like to further analysis your data (use filters, sort columns, count hours scheduled versus hours worked etc). Click on the excel icon below to download the template. Once you have exported your Timecard Analysis Report - Copy and Paste the information into the template. Uncheck (Select All) and select the boxes you want to show. For example, you could select to only show a specific employee or location. Click OK. The column header arrow changes to a Filter icon. Select this icon to change or clear the filter. You can also sort any columns, for example you may want to sort by date. Select the column header arrow for the column you want to sort. Click Sort A to Z to perform an ascending sort (A to Z or smallest number to largest).